...add them to some scones, some birthday cake scones to be exact! I added a teaspoon (should have added more) of cake batter flavoring, and then some colorful jimmies to make them extra fun and festive! The Birthday Cake m&m's are a little larger than the original. Initially I was going to crush them and add them to the batter, but in the end decided against that idea. Next time, I'll do that, which I think will better distribute the flavor. 1. Combine flour, sugar, baking powder, baking soda and salt in a mixing bowl bowl. 2. Add butter to flour mixture and blend in with fingers until pea size. 3. 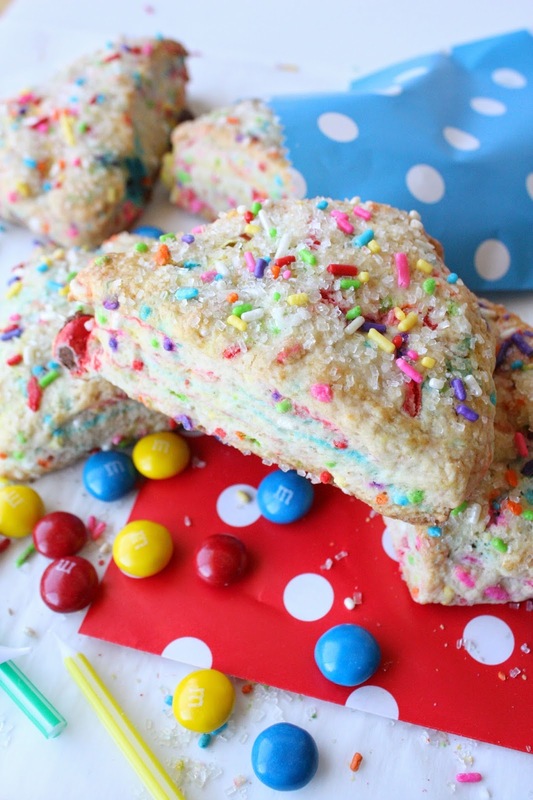 Mix in Birthday Cake m&m's. 4. Add the buttermilk and cake batter flavoring. 5. Mix in until liquid is absorbed. 6. Turn dough out onto your work surface and knead just until it all holds together and form into an 8-inch round disk, about 1-inch thick. 9. Cut into 8 wedges. 10. Brush the egg yolk on the tops of the wedges. 11. Sprinkle tops of the scones with the crystal sugar and the remaining sprinkles. 12. Bake at 400 degrees for 15 minutes or until golden brown. I love these! After I saw you post a pic of the M&M's on Facebook, I ran to CVS and bought some. You are right, the cake batter flavor is very faint and they are bigger than normal, but they are still festive and I love the primary birthday colors. Pinned! Glad you were able to get some too:) Thanks for your comment, Shannon! So colourful and delicious! I love them, Sue. I LOVED them! We all did, actually! They were so delicious!! Thank you, Mom! Wow -- what a fun new way to incorporate Birthday Cake flavor. 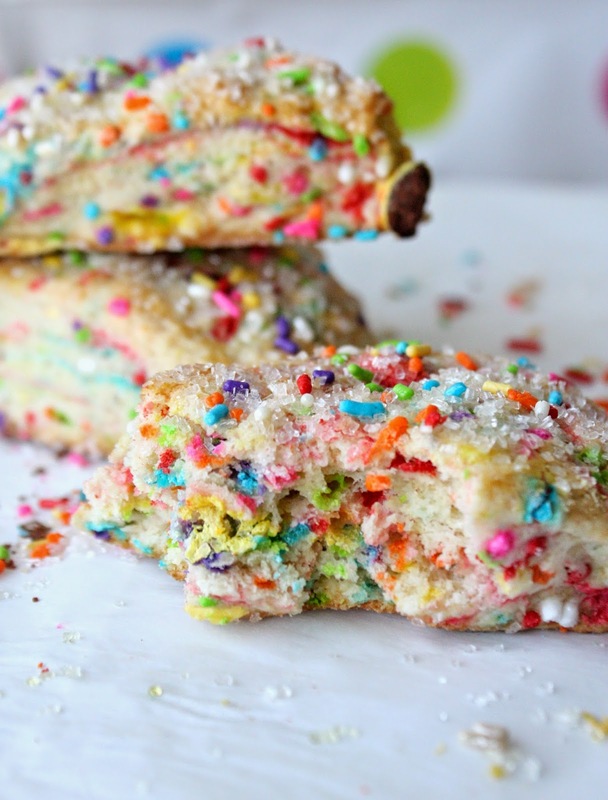 I'm a huge fan of funfetti/birthday cake, so these will definitely be on my "must-try" list. Thanks for the inspiration! Thanks for stopping by and commenting, Jamie! Oh I just love these! I'm slowly re-subscribing to all my favorite blogs, for some reason I stopped getting them delivered to my inbox. Hopefully that won't happen again and chance missing your creations! These just make me smile!